In “Breaking for the Border – Great Escape Road Trip Part 1″, Richard Gooding and myself completed Stage 1 of the Great Escape Road Trip in the rather brilliant Audi UR Quattro. After a brief ten minute stop at the Stage 2 rally point we reluctantly handed over the keys and picked up our next car, a 1976 MGB Roadster. This particular car was actually the MGB restored by Practical Classics and Wheeler Dealer’s Mike Brewer & Edd China at the NEC in 2014. And with the upgrades carried out at the show, we were in for a treat. This 1976 MGB Roadster looked smart with its converted chrome bumpers. The weather on the day was dry but cold and we braced ourselves for a fresh air blast in the classic British convertible (we had been spoiled to be honest by the cosy Quattro). This time it was Richards turn to drive so off we went in the MGB. After briefly struggling to turn off the wipers (that classic wipers/indicators panic moment) we settled in to the drive. 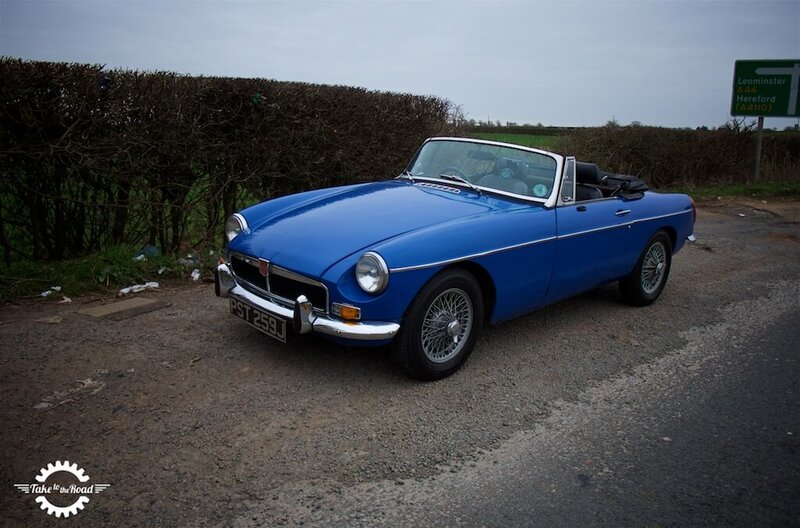 The MGB Roadster is probably one of the most recognisable of all British convertibles and we were immediately impressed at how roomy the compact the two seater was. Despite its size it had acres of leg room, comfortable seats and the arm rest over the transmission tunnel was perfectly positioned, allowing for a very relaxed driving position. It might not have been sunny or warm, but the open air sporty feel was there. 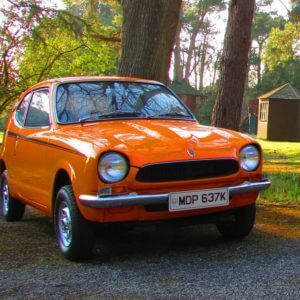 The 1.8ltr engine was eager, moving us very swiftly along the twisty A roads and actually felt pretty powerful. The cars handling also impressed. While the steering was a little tight and heavy compared to the Quattro, the tiny wheel allowed us to point the car into the bends with precision. 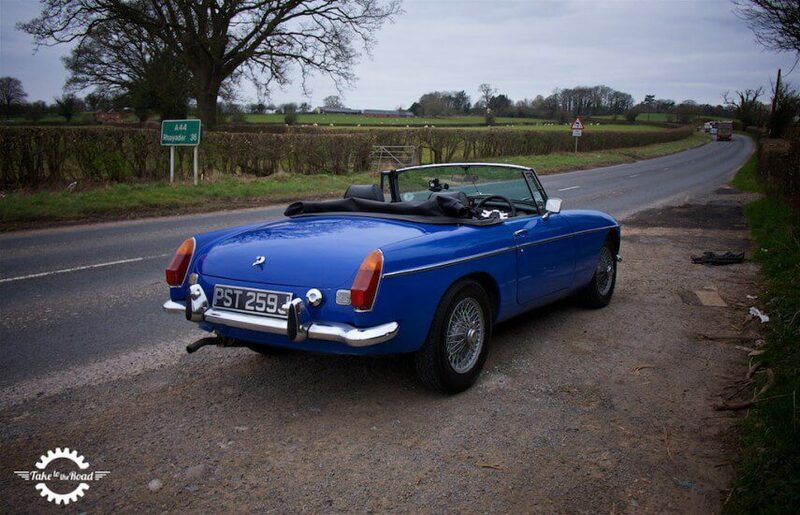 To the casual observer this 1976 MGB looks standard but it actually sits on coilovers which reduced the ride height. The affect was immediately noticeable as the car felt planted in the bends with hardly any body roll to speak of. And with the rasping exhaust note behind us and the open air all around us, the MGB felt very sporty indeed. The lowered suspension did compromise the ride a little especially when we encountered some rough tarmac, but overall the conversion was a good balance between comfort and handling. The suspension upgrades done at the NEC really sharpened up the Roadsters handling. So after the awesomeness of the Quattro, both Richard and myself were very impressed with the capabilities of this classic British roadster. At 12.30am we arrived at the Welsh town of Crossgate which was at the end of Stage 2. Everyone taking part in the Great Escape Road Trip packed into the service station cafe for much needed refreshments, the air filled with excited automotive conversation. As we tucked into some hot food and cups of tea, we wondered what we would we get next. 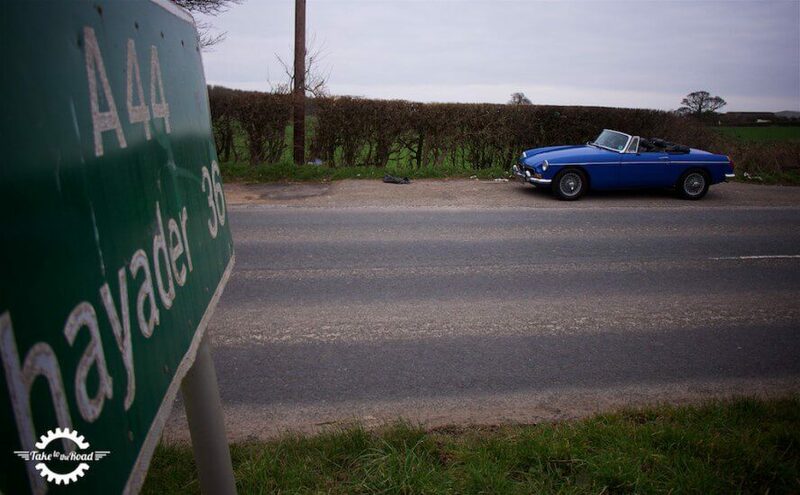 Having fully defrosted from the open air drive in the MGB, we picked up our keys to our ride for Stage 3. And it was a 1966 Fiat 500. We couldn’t have picked a more characterful car for Stage 3. We knew it was a bit of a gamble to get the tiny little Fiat for Stage 3. We were after all in Wales and would have to navigate twisty, hilly roads in the runs smallest and slowest car. But undaunted we set off for what would prove to be a rather lengthy drive in the LHD Italian wagon. 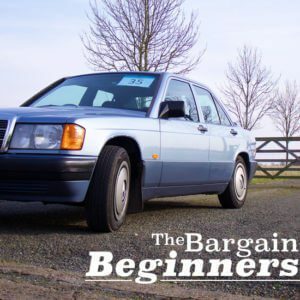 Having driven a Fiat 850 Berlina before, I felt as though I was prepared for the atypical driving experience you get with a compact, rear engine Fiat. Basically that means no power from first to second gear with the car really only coming to life in third. What I wasn’t prepared for was the fact that this 1966 Fiat 500 had a non-syncromesh gearbox and an almost Ferrari like launch control affect when you lifted off the clutch in first gear. It was both surprising and hilarious and just added to the overall character of the car. The little face that makes you and everyone else smile. Despite its tiny size, the Fiat 500 is a roomy car on the inside and doesn’t feel at all claustrophobic. 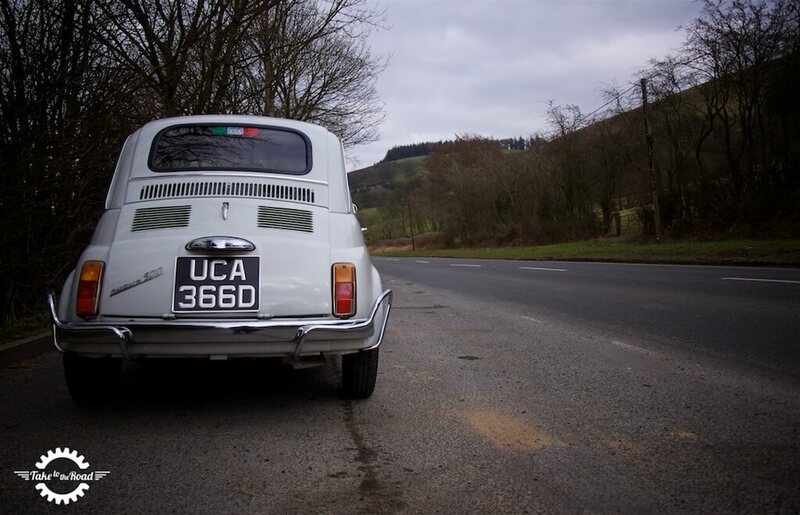 Once I got the hang of the clutch and the gearbox (to be honest I didn’t perfect the double de-clutch technique at all), the little Italian moved along at a brisk pace, the tiny engine roaring along as we climbed up and down the Welsh hills. The steering was a little vague and the drum brakes a touch dull but thanks to its size it was possible to carry momentum into the bends and glide it round and out the other side. And this approach was key because if you didn’t keep that momentum up (i.e. keep your foot buried on the throttle), it quickly became a lot of hard, slow work to get it up the next hill. 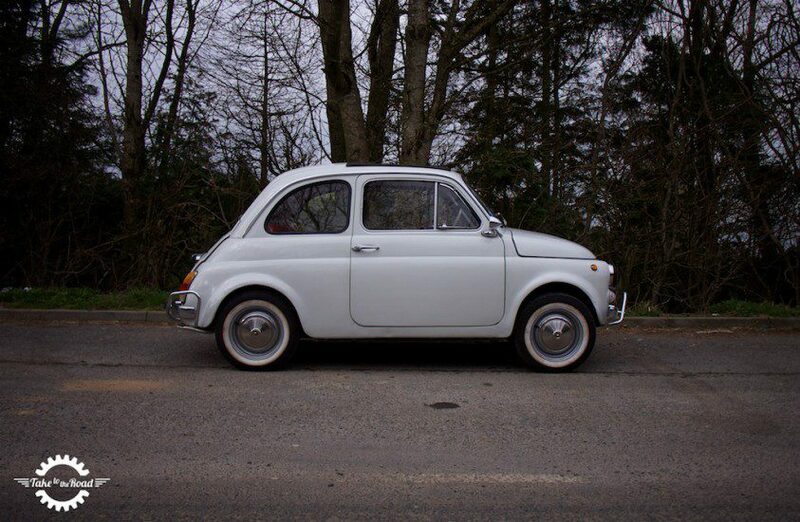 With just a 499cc engine the little Fiat 500 did struggle. But it was fun. 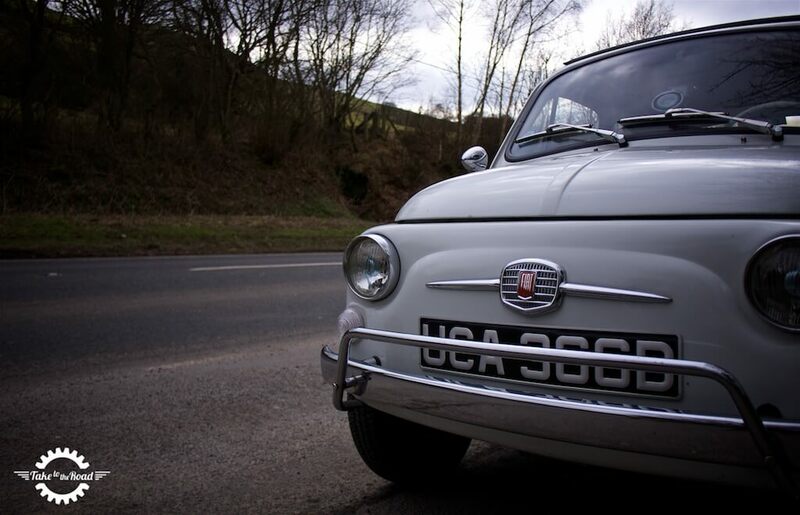 As we blasted along in the Fiat little did we realise we were actually going in the wrong direction. We’re not quite sure what happened but the directions in the Stage guide book told us to turn left outside the service station in Crossgate. Which we did. But the further we traveled the more we felt we’d gone wrong. And we had. Realising the error we doubled back but by this point we had lost roughly forty five minutes. Not ideal when you are driving the smallest and slowest car on the run, in Wales, with lots of hills. By the time we got to the end of Stage 3 we were physically exhausted after spending a lot longer in the unrefined little Fiat than was originally planned. And even though we enjoyed the entertaining drive in the Fiat 500, we were rather relieved to be given the keys to a very familiar sight for Stage 4.